I swear every house has one. You know what I am talking about, that crazy box or drawer that is a tangled mess full of cords. Every time you need to look for a cord you grumble under your breath because you are going to have to go through that entire mess to find the right one. Even if you find the cord easily, the next step is trying to get it untangled from all of the other crazy cords in the pile. It is a dance I have done over and over again. 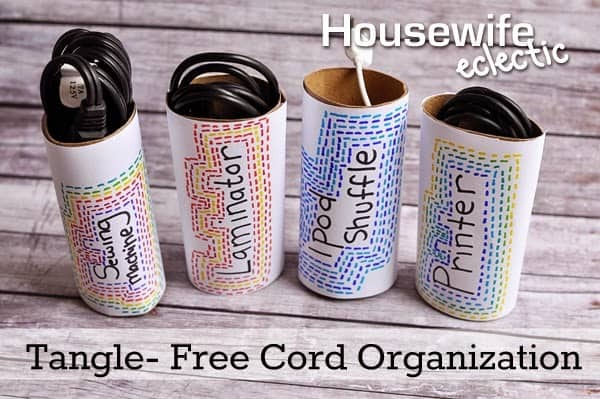 I have tried just about everything I could think of without much success, until a couple of years ago, I discovered the magical cord organizers that every house already has laying around. Toilet paper rolls are the secret to an organized cord drawer. I love that they are essentially free and that you are reusing something instead of tossing in the garbage. 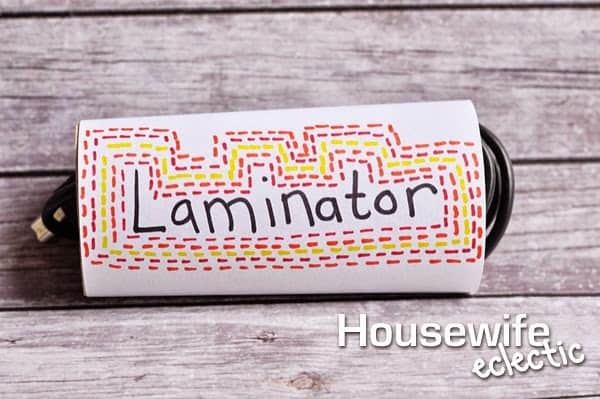 Pair that with paper and my favorite crafting medium, Sharpie markers, and you ready to create an organized space that will be easy for anyone to use. I seriously may own Sharpie markers in every size they make. I can’t get enough of them. Needing more of these organizers was just the excuse I needed to head into Staples and buy more Sharpie markers. Love my mess? I swear the soda can is something for another craft project, not garbage. The bowl on the other hand, I have no idea what that is doing in there. 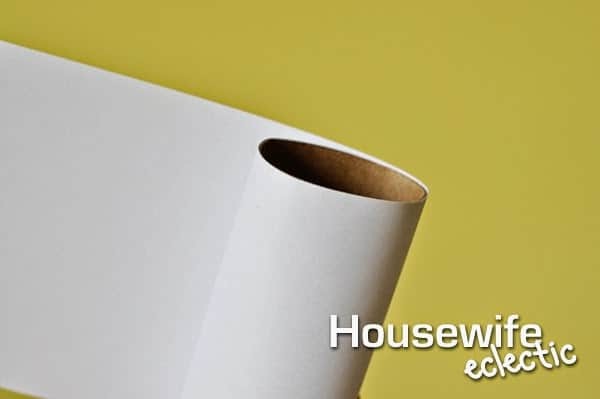 Line up your toilet paper roll on the edge of your paper. 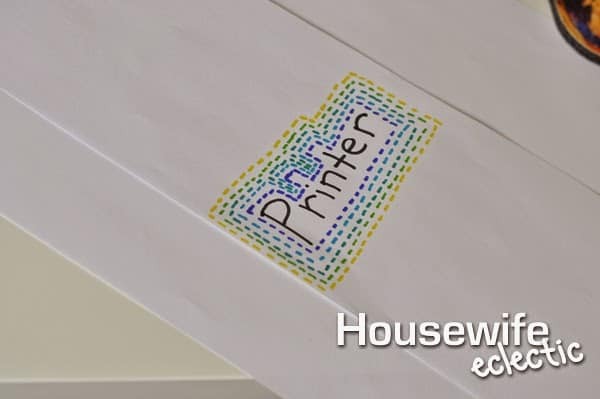 Mark where the roll ends on the paper and cut one long strip the paper. 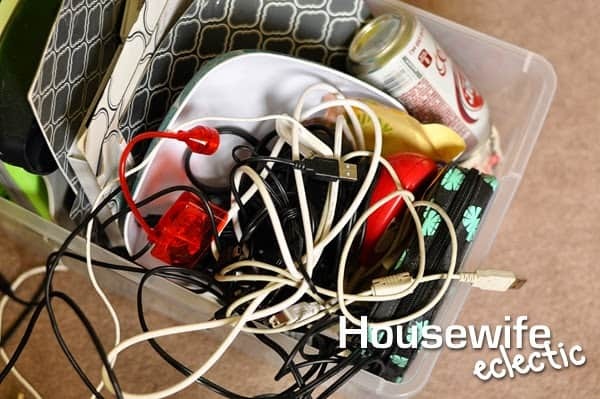 Write a name of one of the cords that you need to be organized, such as the printer, a camera cord, and charging cords for various electronics. 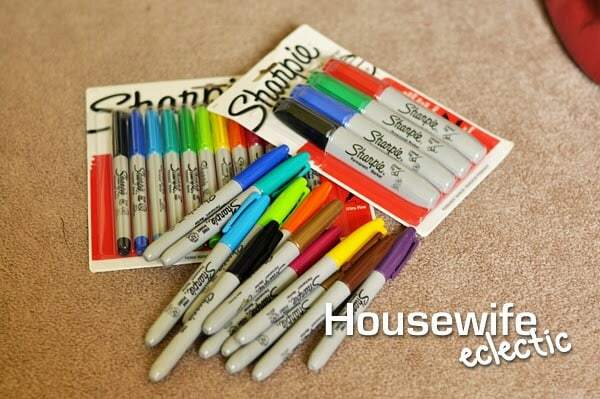 Decorate around the words with Sharpie markers. Tape one end of the paper on a toilet paper roll. Wrap around, making sure to not cover up the label. 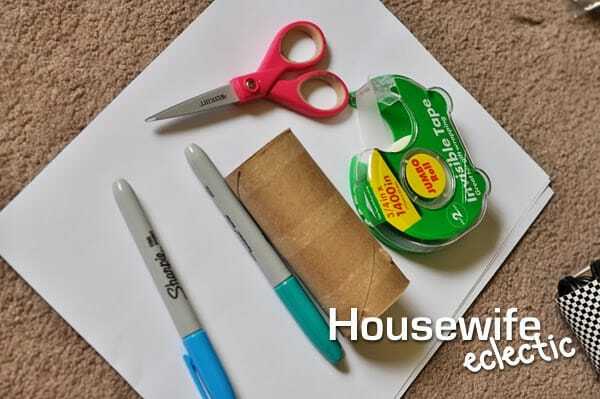 Trim off the excess paper and then tape down the other side. Wrap your cords so they are snug inside the rolls. I have found the best way to do this is to wrap your the cord around your hand several times. This make it just about the right size to slip into the cardboard tube. For most cords, there isn’t any need to use a rubber band. The tube will hold them tightly, for a few cords, such as our smaller chargers, I added a rubber band. What about the cords that have larger plugs on them? No problem. Wrap the cords the same way as above and stick the cord in the tube with the box hanging out. Just make sure to put it box side down in the drawer if you are standing them up. Doesn’t that look better? I absolutely love the way this keeps all of my cord organized and I can easily tell which cord is which. No mess and no trying a bunch of different cords to see if they fit and the Sharpie markers make it colorful and fun. 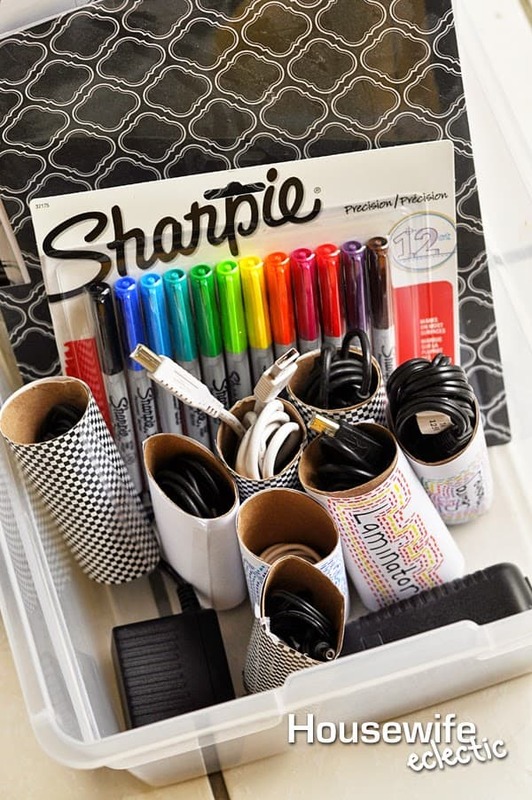 How will you get organized for back-to-school with Sharpie at Staples? That is such a neat idea!! Love it. This is a great idea, if only I was so organized! Gotta work on it! Love it! I finally have my cords in a box, but not untangled. Will try this for sure (if I can get my TP rolls back from my bunny!). I love it an will have to try this! I love Sharpies. And this is such a cute way to use them. I've been doing this cord organization in my house for a long time now. I cover the rolls with contact paper. Works really well too. How friggin cool is this idea?! I lovve it!!!! 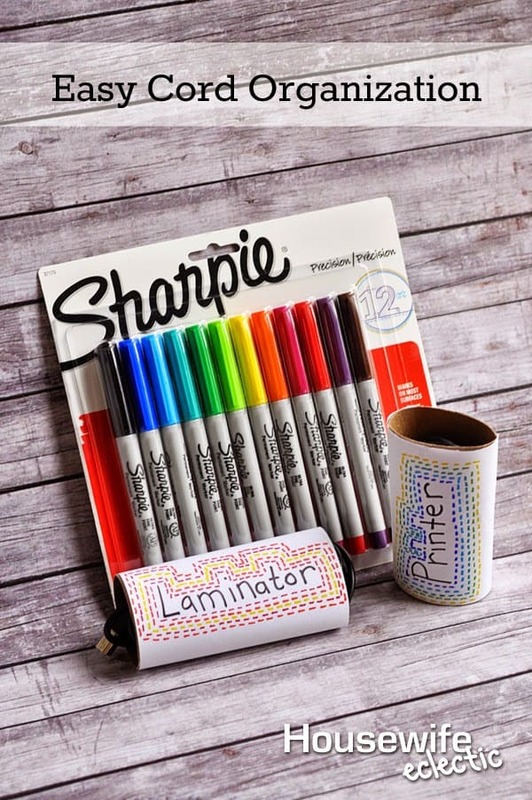 I love sharpies – and up cycling! 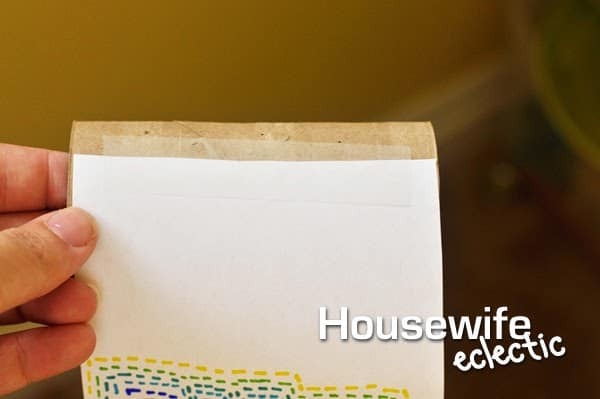 What an amazing way to use all those old toilet paper roles and organize wires. So great! Cute idea. I am going to do this as we have cords all over the house. Ok, this is pretty darn brilliant I have to say. Cords are a huge problem for me too! That tangled mess looks like my husband's power supply basket. Great tip, will be getting crafty soon. That is so clever! I hate boxes of cords! 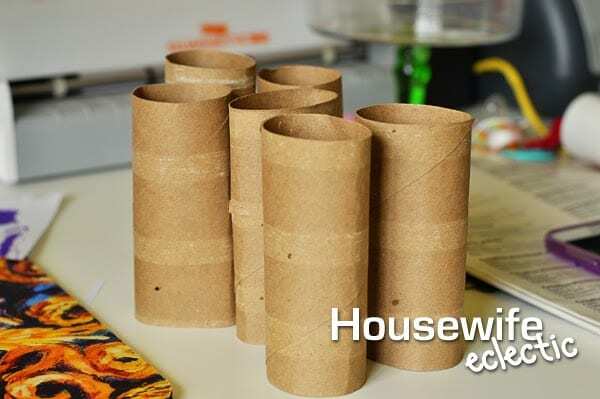 Great idea, we have tons of cords that could be hidden with these cute little toilet paper rolls! So totally smart! I hate having cords and having no clue what they go to. And we've got plenty of them. I don't even know how it happens in such mass quantity. These are cool, never thought I could turn the empty tissue paper roll into something very useful. I think my kids can do this project. Awesome ideas! My cords are forever tangled. This is a really good idea. I really hate opening up my drawers and having all of my cords tangled.